It doesn't matter what kinds of swimming pools we're talking about here, whether the most simple pools, kiddie pools, play pools, aboveground pools, luxury pools, you must always keep in mind that accidents happen and it only takes a second for tragedy of swimming pool accidents. What child doesn't want to have a little bit of fun in a swimming pool? Almost everyone (including those who are kids-at-heart) loves to have a dip every now and then and young kids are especially enticed by swimming pools. If there is ever an access to the swimming pool you can be sure that kids will discover the way at an early age. While most family pools are kept secure there are accidents and we must keep in mind the reality of accidental drowning that has led to many heart-aches among several families particularly if a child is involved. How many times have we heard the grieving parents or adults that the accident would not have happened had they been more attentive? We are constantly reminded of how important it is to keep toddlers and older children away from the pool if there is no adult to supervise them. So you, as the responsible adult, would take every swimming pool safety measure that you can think of to make the pool and its surroundings safe for children of all ages. use life vests that have been specifically designed for this purpose; and so much more. On the other hand, we sometimes forget that swimming pool chemicals can also pose as a hazard to children's health. Remember that the danger sign is printed on the label for a reason, which is why you should not overlook this part of the safety process. stored in a cool, dry place that is properly ventilated. 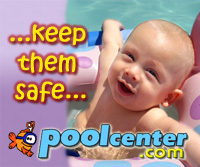 Don't allow people particularly children to use the pool while it is being treated. Invest in swimming pool test kits but make sure that you change the chemicals used for these test kits annually. Overall, short of teaching your child how to swim, there are a number of different precautionary measures that you as an adult could take to keep the young ones from getting in harm's way and combining all of these precautionary measures can help keep your child safe from possible harm. If you're interested in getting a new swimming pool then you can find information and resources for inexpensive aboveground pools, luxury inground pools, rock pools or modern swimming pools. If you already have a swimming pool please do check your swimming pool safety items to be sure they're in working order.....and KEEP them in working order, doesn't matter if you're using the pool or not....doesn't matter if it's pool season or not, swimming pools, simple pools or luxury pools, ALL swimming pools are attractive nuisances for kids. Keep it safe. Don't forget to have the latest swimming pool games and some great swimming pool toys when the family gets together and friends come around you'll want to be ready to bring on the fun. 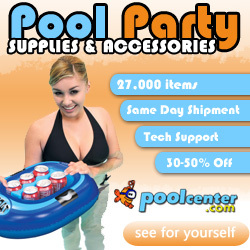 It's easy by picking up a few new pool toys and games. Fun for all.... don't forget something for Fido too. Dogs like pools too, follow simple swimming pool safety for dogs too... now we're talking about family fun. There are many popular home improvements homeowners can make, but perhaps no home improvement is quite as favored by kids everywhere as the good old family swimming pool. A swimming pool in the back yard can be a great way to give your family a vacation all year long, and a great way to make your home the favorite destination for the kids from the entire neighborhood. Those homeowners who are considering installing a swimming pool should be sure to check with several good installers to determine the best type of swimming pool for their home. While many people think first of the in ground swimming pool when they think about a swimming pool, there are many other kinds of pools as well. An in ground swimming pool can be a great addition to the back yard, but the in ground swimming pool is not the right choice for every person. An in ground swimming pool can be very expensive to install, and it can take up a great deal of space as well. In addition, it may take quite some time to have an in ground swimming pool installed, so it is important to plan accordingly. The other choice, of course, is to install a quality above ground swimming pool. Above ground swimming pools run the gamut, from foot deep kiddies pools to swimming pools that are nearly as large and as deep as those built in ground swimming pools. No matter which type of swimming pool you choose, it is important to plan for it carefully. There are some above ground swimming pools that can be installed by the homeowner on his or her own, while some of the larger above ground swimming pools may require the help of a swimming pool contractor. It is important to determine if help is needed and to ask for that help if needed. Finally, after the swimming pool is in place, the homeowner should be sure to put up a high fence around the swimming pool in order to prevent accidental drowning. Most municipalities around the country require that a swimming pool be fenced, but the height of fence specified varies from area to area. Be sure to research local laws before installing your swimming pool, and then dive right in.